The Framework for Great Schools is the primary way the Department of Education partners with our schools. 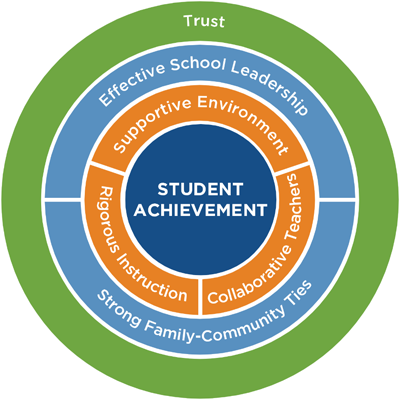 At the center of the Framework is student achievement. The core goal of education is to help students get to the next level and succeed. Surrounding that core are the three elements of student support: instructional guidance, teacher empowerment, and student-centered learning. Beyond the classroom, we need effective school leadership and strong parent-community collaboration. The element that ties all of these supports together is trust. Building trust across the system and within a school—between administrators, educators, students, and families—is the foundation of the Framework for Great Schools. Educators and school leaders can find resources for Applying the Framework for Great Schools on WeTeachNYC. Learn more about New York City’s approach to teaching and learning. Allows the district superintendent to develop a holistic, research-based approach to school support and accountability that recognizes and celebrates what schools do every day. Our approach honors the fact that students are more than just a test score. Provides tailored support to schools and foster professional learning communities. Holds schools and the school system accountable for the shared goal of building capacity to drive student achievement. Ensures a spirit of collaboration, not competition, by establishing a common language for improvement. Brings together the strengths of schools and their communities to support students throughout the school day and beyond. Advances educational attainment by preparing every New York City public school graduate to compete in the 21st-century workplace. Instruction is customized, inclusive, motivating, and aligned to the Common Core. High standards are set in every classroom. Students are actively engaged in ambitious intellectual activity and developing critical thinking skills. The school establishes a classroom and school culture where students feel safe, supported, and challenged by their teachers and peers. Teachers are committed to the success and improvement of their classrooms and schools. They have the opportunity to participate in professional development within a culture of respect and continuous improvement. Principals lead by example and nurture the professional growth of teachers and staff, developing and delivering the instructional and social-emotional support that drives student achievement. School leadership brings resources from the community into the school building by welcoming, encouraging, and developing partnerships with families, businesses, and community-based organizations. Everyone works toward the shared goal of improving student outcomes, preparing students for success in school and beyond. Across the school community, there is respect. School staff, parents, students and administrators value each other. The Framework of Great Schools is grounded on empirical evidence from many of the leading educational researchers in the field. Math and ELA – The authors defined substantial improvement as being in the top quartile of growth in math and ELA scores using a value added approach, looking at how much students in a school improved from year to year and then charting the growth in that improvement over time controlling for student characteristics. Attendance – The authors defined substantial improvement as being in the top quartile of improvement using adjusted attendance trend data controlling for the changes in student characteristics over time in the school. The authors conducted a regression analysis in order to test whether the five organizational features–including embedded trust measures–were predictive in identifying schools with substantial growth in math and ELA scores and attendance. The elements that were identified were derived from findings from a comprehensive literature review and measured by survey data pulled from a mid-year point in the analytic period.